Below are the sales training books that I’ve reviewed on Amazon.co.uk. I’m not a natural sales person and I don’t like hard sell tactics or anything that I feel manipulates buyers for short term gain. I like to treat buyers in the same way that I’d like to be treated. I aim to be a tough reviewer and my five star books are highly recommended with the four star books also well worth reading. The links on the titles of the five star books take you directly to my detailed reviews. 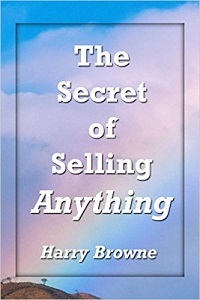 FIVE STARS The Secret of Selling Anything by Harry Browne – I knew the author as an investment advisor but I think this is a very good book on ethical sales techniques. 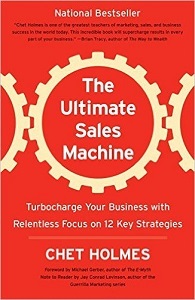 FIVE STARS The Ultimate Sales Machine: Turbocharge Your Business with Relentless Focus on 12 Key Strategies by Chet Holmes – To be successful, you need to be really good at a few things and have pig-headed determination (this link takes you to my review). 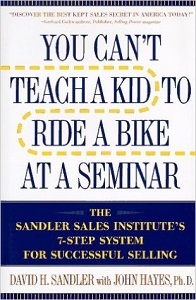 FIVE STARS You Can’t Teach a Kid to Ride a Bike at a Seminar by David H Sandler – A fascinating book to read that will challenge your thoughts about your sales process. The NEW Game Of Selling by Mitch Axelrod – the author is one of my favourite sales trainers and this is a taster for his ideas. I’d have preferred him to write a full length book because that would have been worth five stars based on what I know about his ideas. Close the Deal: Smart Moves for Selling: 120 Checklists to Help You Close the Very Best Deal by Sam Deep – A series of list based articles to improve your selling, based on the Sandler system. One Minute Salesperson by Spencer Johnson – A book to help you to feel good about selling. The Language of Trust: Selling Ideas in a World of Skeptics by Michael Maslansky et al – the book does challenge a lot of the orthodox sales thinking and it’s a challenging read since it says that many beliefs and common practices are wrong or at least don’t work any more with sceptical prospects. The Contrarian Effect: Why it Pays (Big) to Take Typical Sales Advice and Do the Opposite by Michael Port – A well argued and powerful punch against the old, tired, hard-sell tactics. Sales On A Beermat by Mike Southon – A British approach to consultative selling aimed at helping the customer to buy. 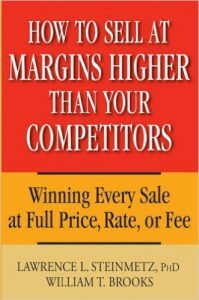 Be a Sales Superstar: 21 Great Ways to Sell More, Faster, Easier in Tough Markets by Brian Tracy – If you’ve never read a book about selling, this is a good place to start. Why People Don’t Buy Things: Five Proven Steps to Connect with Your Customers and Dramatically Increase Your Sales by Harry Washburn – How to adjust your sales process to the different types of buyers. Combat Zone: The Value Based Proposition by Dennis Lewis – Interesting for sales people in B2B Markets but the KIndle version needs to be made more user friendly. The Sandler Rules: 49 Timeless Selling Principles and How to Apply Them by David Mattson – Starts strongly with counter-intuitive sales ideas but fades away and the layout is irritating. More Gross Profit: Increase Your Gross Profit On Every Sale Starting Right Now by Bob Oros – a book mainly aimed at helping sales people resist pressure from buyers to reduce prices. It wasn’t the book I was expecting from its title. How to Influence Buying Criteria by David J. Pannell – too wordy but interesting for anyone who faces customers who treat the product or service as a commodity even though there are clear differences between suppliers. Boost Your Sales: How to Use Irresistible Offers… Without Being Salesy by Lisa Sasevich – as an educational book it is disappointing but as a pitch for a course in writing or on a webinar, it is fascinating. Upselling Techniques: That Really Work! by Stephan Schiffman – More of a general sales training book, marked down because it didn’t live up to the title. Attention: Make Irresistible Compelling Offers by Bob Oros – Not what I was after which was a book about “offers”. It is actually about improving your selling skills and the focus is very much on what you can say quickly to encourage the customer to listen to you. What’s Keeping Your Customers Up at Night? : Close More Deals by Selling to Your Client’s Pain by Steven Cody – This is a topic that deserves to be much better understood but I didn’t like the stye of this book at all. Selling to the British – How to serve your customer, increase your sales and make more profit by David Peers – I hoped this would be interesting but I hated the writing style and would have thrown the book across the room in disgust if it wasn’t a kindle version.